The stock threatened key support on Wednesday. TheStreet's Jim Cramer answers viewers' Twitter (TWTR) questions from the floor of the New York Stock Exchange. AT&T's (T) proposed $48.5 billion deal to buy DirecTV (DTV) is advancing as Federal Communications Commission chairman Tom Wheeler has recommended that his colleagues vote to approve the merger. 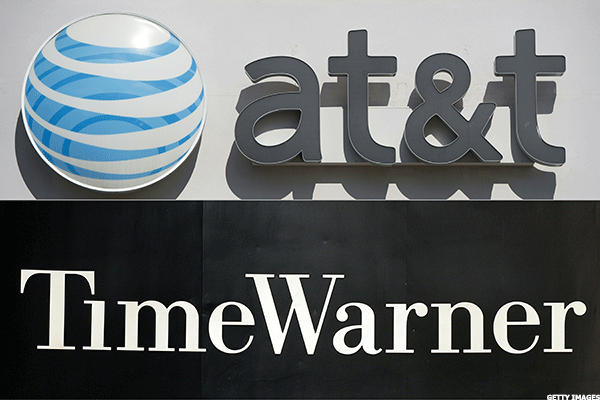 The highlight of AT&T's (T) earnings report could be an update on its proposed merger with DirecTV (DTV), according to Angelo Zino, an equity analyst at S&P Capital IQ. The latest mega-merger is been talked up by Wall Street, but the combined AT&T and DirecTV will continue to underperform. The Greek Prime Minister Alexis Tsipras is reportedly ready to accept most European creditor demands, according to the Financial Times. Merger with DirecTV is generating interest. Shares of AT&T (T) wrapped up Tuesday's trading day to the upside, by 2.7 percent. The stock is TheStreet's Move of the Day. Facebook (FB) was the best performer on the Nasdaq Tuesday. Here are some of the best wireless telecommunication services stocks TheStreet Quant Ratings says you should consider looking at. The two were akin to the stragglers in a game of musical chairs. Deutsche Telekom's T-Mobile (TMUS) is reportedly in talks to merge with Dish Network (DISH). Shares of Time Warner Cable (TWC) soared over 7 percent on Tuesday, making it TheStreet's Move of the Day. Charter Communications (CHTR) agreed to buy Time Warner Cable (TWC) for more than $55 billion in cash and stock, a deal that's valued at $78. S&P Capital IQ Analyst Angelo Zino says now that Verizon (VZ) is buying AOL (AOL), he expects other telecom companies to make content partnerships, as consumers shift to video. For Tuesday, May 5th we get earnings from HSBC Holdings plc (HSBC), DirecTV (DTV), Kellogg Company (K), Discovery Communications (DISCA), Office Depot (ODP), and the Walt Disney Company (DIS). Do I Have to Say This Stock's Name? The only cable/entertainment company that isn't overvalued. Stocks slipped in midday trading Thursday with global economic worries. A CEO's got to know his limitations. And he does. AT&T said it will buy DirecTV for $48.5 billion to gain more than 38 million video subscribers. And speaking of millions, GoPro filed to raise $100 million in an IPO.